We need 30 Volunteers to act as Table Leaders to run the different math activities. No previous experience with the activities or with math is required. All that is required is an interest in mentoring and coaching. We will email you some materials to read and we will hold 1.5 hr training session that morning before the festival to learn about the activity you will lead. Volunteers are expected to arrive between 8-8:30AM and be done by 12:00 but welcome to stay for lunch between 12-1. For the first time in New Mexico, JRMF was held on Friday February 24, 2017! 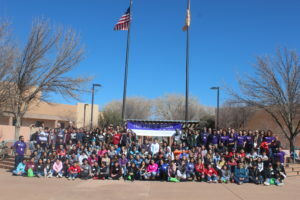 STEM Santa Fe is proud to have brought for the first time in New Mexico the Julia Robinson Mathematics Festival in Santa Fe. This Festival is meant to inspire students to explore the richness and beauty of mathematics through activities that encourage collaborative, creative problem-solving. The Festival introduces kids to the beauty of mathematics by providing interesting, inspiring, engaging, thought-provoking problems.